Photographs by Shelby Lee Adams. Narrative by Lee Smith. University Press of Mississippi, Jackson, 1993. 108 pp., 50 duotone plates, 10x9½". "Here in pictures and in words the photographer Shelby Lee Adams and the novelist Lee Smith explore their unique Appalachian homeland. Their photographic and literary art confronts you and draws you intimately close with images charged with powerful feelings. 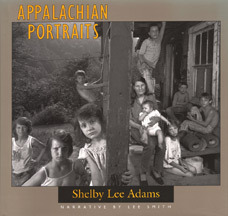 Though the people of Appalachia have been photographed often--by Lange, Evans, Bourke-White, Ulman and others--there has not been, until now, a photography book of this genre from an insider's perspective." --the publisher. MS007-LTD Limited Edition is no longer available.